This week’s post is a guest post by Lea Hartman. 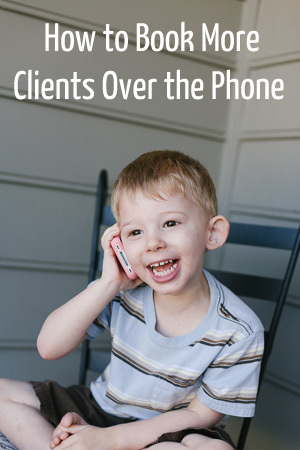 Are you afraid of talking to prospective clients on the phone? I’d guess that the majority of photographers prefer email to phone contact any day. However, the phone is a great way to set yourself apart from the rest of your competition and get a great first impression of you in their minds before your competitors. So today I’m going to talk about how to use the phone to your advantage so that YOU can get the booking! Set a great first impression before your competitors have even finished replying via email. A quick call in response to an inquiry instead of replying via email is a quick way to get a fabulous first impression before your clients even have the chance to finish writing an email response. While initial consultations for weddings are almost always done in person, using the phone to set up a consultation is a great way to give off a great first impression and actually get the consultation. You can read more about what to do for wedding consultations here. Today we’re going to focus on phone consultations for portrait photographers. Portrait photographers often only have phone consults if they don’t have a studio. Whether in person or on the phone, I think that consultations are a must and if you’re not doing them, you’re missing out on a great opportunity to manage client expectations before you ever even pick up your camera. Not only that but it’s an opportunity to offer your client a lasting first impression about you and your business. And the best part is that it’s a first impression you can be in 100% control of. So let’s look at what a phone consult should include. Make no mistake, a phone consult is still a meeting with your client. True, you could do it in your pajamas, but either way, you are representing your business. The lack of face to face communication doesn’t negate the necessity of professionalism. You can learn how to book more clients over the phone by approaching a phone consultation the same way you’d approach an in person meeting. One of the best ways I’ve found to prepare for a phone consultation is by knowing what I’m going to say in advance. I typed up a simple questionnaire that I can then use for each consultation. It contains basic questions like contact information, names and ages of children, as well as birthdays for everyone in the family (so I can surprise them with birthday cards). I like to know what I can do to impress my clients so I make sure to ask them about a few of their favorite things too. I’ve also included questions about what they want to get out of their session and what types of products they are interested in using to display their images. This gives me an idea of what I need to shoot for during our session. Not only does this offer me tons of relevant information about my client but it also acts as an outline for the overall flow of my consultations. If the conversation gets off track, I can steer it back on course. Maybe you feel like conducting your consultations via telephone is putting you at a disadvantage. It doesn’t have to be that way. With planning and practice, you can rock a phone consult and use it to create a lasting impression. Schedule them for a specific time, just as if you were going to meet them in person. This way, you can be fully prepared and your client will know exactly when to expect your call. Phone tag isn’t fun for anyone and it’s important that you’re in control, not left trying to gather your thoughts because your client called at an inconvenient time. Free yourself from distraction. I have found it very helpful to make sure I set aside 30 minutes for each phone consultation and to conduct them when my kids are sleeping or my husband is able to corral them elsewhere. This way, I’m able to focus solely on my client and our communication. There’s nothing more unprofessional than having to interrupt your client mid-sentence so that you can tell your three year old to stop holding himself and go potty. Write it all down. Have a pen and paper in hand before you even dial your client’s number so that you’re prepared to take notes on everything they say. I typically conduct my consults a month in advance of their session and if I didn’t write it down, my best intentions won’t help me remember it. As an added perk, this gives me the opportunity to really knock their socks off when I show up for our in person sales appointment with not only a beautifully wrapped gift of their favorite coffee but a mock up of a gallery wall because Susan mentioned her desire for one during our phone consult. Keep it real: Don’t just speak AT them. It’s important to engage with your client. Ask personal questions (personal, not prying) and find commonalities you can bond over. As a family photographer with three children of my own, discussing motherhood and the chaos of raising kiddos is a common theme between me and my clients. Make sure you’re not the one doing all the talking. Listening is perhaps even more important. Asking follow up questions is a great way to let your client know that you’re really hearing what they have to say. For instance, if your client tells you that they want to get pictures done before their family vacation this summer, ask where they’re going or how long it’s been since they were able to get away as a family. Share a quick anecdote about your most recent family vacation. The real key to remember? Speak with humility. There’s a big difference between confidently sharing what you can offer to someone and tooting your own horn. No one likes a bragger, and it can really turn people away instead of helping. Remember, this is all about your client, not about you. Maybe you’ve read all this and thought it sounded really great for someone who’s good at talking on the phone. Maybe you thrive in email communication where you can re-read and re-edit your responses. Maybe the very thought of conducting a consultation via the telephone makes you break out in a cold sweat and paralyzes you with fear. Take a deep breath. Phone skills are learned and there’s no reason you can’t be a student. Like anything worth knowing, it takes practice. Write it down and then practice talking to yourself in the mirror. In fact, the beauty of it is that when conducting your consults on the phone, no one will know if you’re reading from a script. In what way do you feel your phone consultations could be improved? Leave a comment to share your struggles and successes in this area. Your story may just give someone else the encouragement they need.